The fresh green chiles have been available for a couple of weeks but now it’s time to get serious. The roasters have been set up outside my grocery store, ready to scorch case after case of hatch chiles. They are easy enough to roast at home… but they’re also easy enough to buy a bag of fresh-roasted-by-someone-else chiles and take them home to chop and freeze. 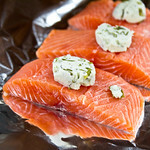 Or mix into a stick of butter and top baked salmon. Or scatter over pepperoni pizza. Or blend into homemade ranch dressing. Chopped hatch chiles are mixed into softened butter with salt, pepper, and a squeeze of lime juice. The smokey chiles and tangy lime juice in the compound butter bake up wonderfully over salmon or tilapia. And when you consider that it takes 20 minutes to put dinner on the table and clean-up involves balling up a sheet of foil, I dare you not to make it twice a week. Preheat the oven to 400 and line a baking pan with foil. Lightly oil or spray the foil. In a bowl, combine the softened butter, chopped hatch chile peppers, squeeze of lime juice, a pinch of salt, and a few grinds of black pepper. Top each salmon filet with ~1 Tbsp of the butter mixture. The butter will keep in the fridge for a couple of weeks, easily. Bake the salmon for 10-12 minutes until the salmon is just still translucent in the very center of the thickest part of the fillet. 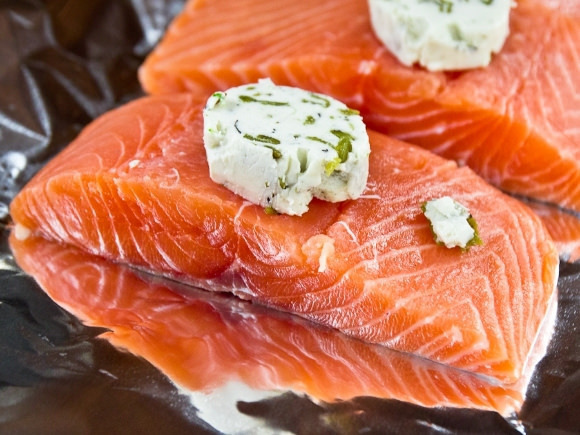 While the fish is cooking, microwave some steam-in-bag veggies and open a bottle of wine.